Its a bit early to post Holi recipes but I’ve just join a new group #Foodiemonday #bloghop. Every Monday we post a recipe based on the chosen theme. The 31st theme is #Fusionthandairecipes. Its really really hot in Mombasa and the only thing I could think of was something extra extra cold. I decided to make kulfi with my thandai masala. Taking photos was not easy as the kulfi was melting too fast. Holi, a festival of colors is celebrated by Hindus worldwide. In India its mainly celebrated by throwing, applying, drenching friends and families with different colour powders and coloured water. The true reason for celebrating is lost in all the colour throwing, drinking and partying. In reality, the eve of Holi also known as Holika is when an effigy of Holika is burnt to celebrate the triumph of good over evil. Prahlad, a devotee of Lord Vishnu did not burn in the fire while his aunt did(who had a boon that she cannot be destroyed by fire). Many parts of India celebrate the eve of Holi as Phagwah. Putna the evil demon was summoned by Kansa (Lord Krishna’s mama) to breastfeed all the babies in Vrindavan and surrounding areas with poisoned milk. Baby Krishna sucked out not only the poisoned milk but also her blood and she burst into flames. Lord Krishna coloured the face of Radha to show his love to her. Since then, people colour each other with colours. I stay away from all the coloured water and powders as they make my skin itch and I hate it when the colour does not come out easily from my skin and hair. Traditionally all the colours were made from natural materials e.g, the green from mehendi leaves, red from palash flowers, yellow from turmeric, pink or purple from beetroot etc. Today’s synthetic colours are not only harmful for the skin and hair but are not environmentally friendly at all. Many plants die because of the coloured water. We normally celebrate Holi by preparing some nice food to offer to Lord Krishna. Put a small tilak on the forehead and usually there are bhajans at the temple. So I go for that. Lets strive to bring a more meaningful celebration of Holi by making the lives of near and dear ones more colourful with love, understanding, togetherness and tolerance. I didn’t have mawa (khoya) and wanted to make thandai kulfi for guests. I used condensed milk and milk powder to make the kulfi. 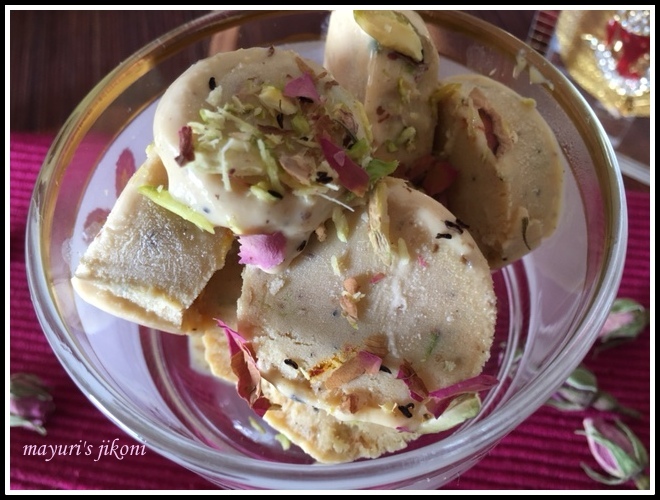 Loved it and its so quick to make delicious kulfis. Check out the recipe below. Roast fennel seeds, peppercorns and poppy seeds over very low heat in a pan or tawa. Roast till the poppy seeds begin to pop. Remove the mixture from the pan and put it on a plate or in a bowl. Add saffron strands. Using the same tawa or pan, roast the almonds lightly over low flame. Then roast the pistachios for a few seconds. Grind all the thandai ingredients to a powder. Heat milk in a pan over medium heat. Bring it to a boil. Grate khoya and add to the milk. Add sugar and heat the milk mixture till it becomes thick. Stir the mixture frequently so that it does not stick to the bottom of the pan. When the mixture becomes thick, a bit like custard, add the thandai masala, pistachio powder and rose water. Add to the milk mixture. Mix well. Pour the mixture into molds and freeze before serving. Mix milk, sweetened condensed milk and milk powder in a pan. Mix and make sure there are no milk powder lumps. Put the pan over medium heat and let the mixture come to a boil. Let it simmer over low heat till it becomes thick. Make sure you stir the mixture frequently so that the milk does not get burnt at the bottom of the pan. Add thandai masala, rose water and pistachio powder. Mix well and let the mixture cool down a bit. Pour into kulfi or lolly molds and freeze it. Serve garnished with chopped pistachio and rose petals if you like. Add rose petals to the cool mixture if you like. Can freeze the mixture in an airtight container or lolly (pop) molds if you don’t have kulfi molds. Use leftover thandai powder to add to cold milk. Sprinkle thandai powder over vanilla ice cream before serving. Can freeze the mixture in clay pots for a more traditional appeal. I didn’t add extra sugar when I used sweetened condensed milk. Using condensed milk and milk powder instead of khoya gives it a more ice cream texture. Perfect to beat the heat!! Lovely twist by adding thandai flavour. Happy Holi !!! Happy Holi to you too Amrita and thank you. thank you Alka and Happy Holi to you too. Thanda.. Thanda.. cool.. cool..!! awesome recipe. thanks for sharing. Kulfi looks super yummy. Loved the idea. Cool cool!!! As I said before I was craving for ice cream and this ice-cream us making me more crazy!!! Lovely share Mayuri!!! Kulfi looks super cool, wish I could grab one right now…beautiful share! Delicious looking Kulfi Mayuri…and the Thandai is a perfect addition. I love kulfi, especially danadar kulfi we used to get in India. With the thandai powder it makes more flavourful and adds texture. Thanks Jagruti it does make it very flavorful. I love kulfis. Takes me back to childhood when we had kulfi from a stall. Bookmarking this delicious recipe for kulfi. The thandai makes all the difference does it not? Thanks Archana and it does as its an unusual flavor. Please try the recipe. Wow.. thandai kulfi .. I must make this as thandai is my favourite drink .. we make it always in summer.